After a disappointing day of skiing at Park City Resort without any new snow in the forecast, our family decided to do something else the following day. 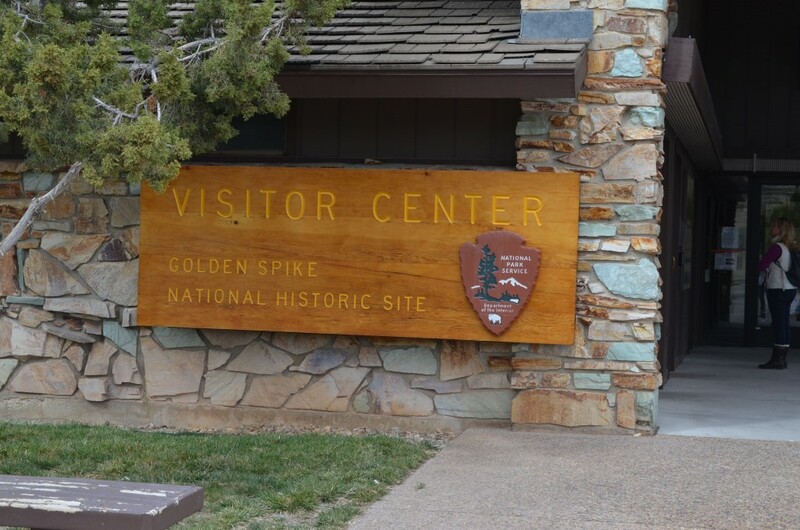 We drove into Salt Lake City, had lunch at In-N-Out Burger, and then continued northeastward towards Promontory Summit to visit the Golden Spike* National Historic Site. 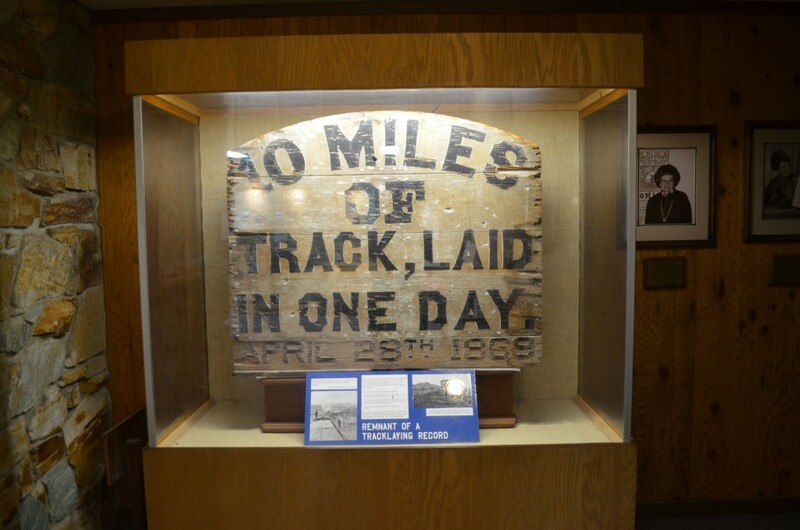 The Golden Spike National Historic Site is located at the very spot where the Central Pacific (from the west) and Union Pacific (from the east) Railroads met on May 10, 1869 to form the Transcontinental Railroad, an historic linkup that is still an important part of commerce today. The original “Transcon” connected Sacramento, California with Council Bluffs, Iowa (just across the Missouri River from Omaha, Nebraska). Today, much of the track near the historic site has been pulled out, since the original route north of the Great Salt Lake was deemed unnecessary after the completion of the “Lucin Cutoff” in 1903—the new route drives east-west straight across the Great Salt Lake into Salt Lake City itself, eliminating the numerous curves and grades near Promontory. The original 1869 route had to go north of the area due to the dearth of naturally-occurring fresh water near Salt Lake City, the fresh water was critical for the water-cooled locomotives in the 1860s. The ceremony commemorating the meetup was very elaborate, involving the presidents of both the Central Pacific and Union Pacific shaking hands at the meetup point, the driving of a golden railroad spike, and a very famous photograph.To reach the town of Promontory from Salt Lake City, you take an exit off I-15/84 north of the Great Salt Lake in Corrine, Utah and then head westward about 30 miles on Utah Route 83. The scenery is unlike anything I’d ever seen, with swamp-like features to our south (near Bear River Migratory Bird Refuge) and mountains towards the north and west. There are some ranches, but very little else. *The original Golden Spike isn’t located at this location. It’s located at a museum at Stanford University. 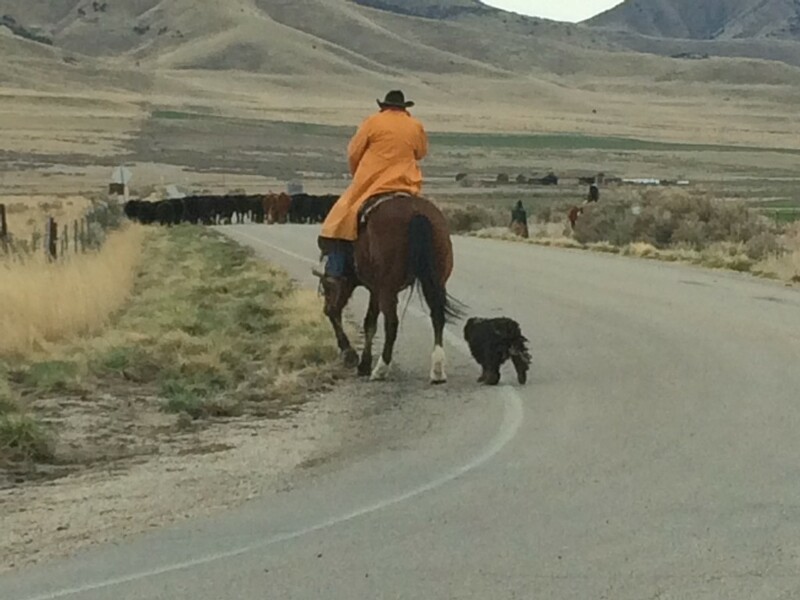 A cattle drive! How cool! This was less than a mile from our destination. The boys got to see that herding dog up close and tried to talk to him out the window. 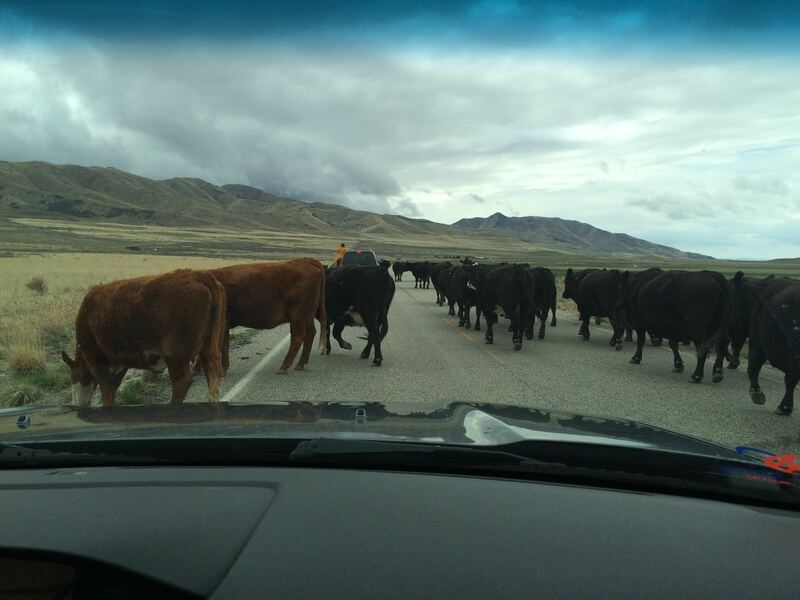 The cattle were actually moving along at a good clip, but we had to roll slowly: you can see the two on the left who had abruptly started grazing. Upon reaching the Visitor Center, we were very surprised at how many other cars were parked there. I was reminded of our trip to the Ashfall Fossil Beds in Nebraska, where we realized we weren’t the only people willing to go so far off the beaten path. The Visitor Center is old, but full of great information. The historic site consists of a visitor center, a locomotive engine shop, and several sites on the property that commemorate assorted achievements related to the meet up. Right after we arrived, we checked in at the visitor center to see what time the engine shop tours would be. We were able to fall in with a tour within a few minutes of arriving, so we did that first. 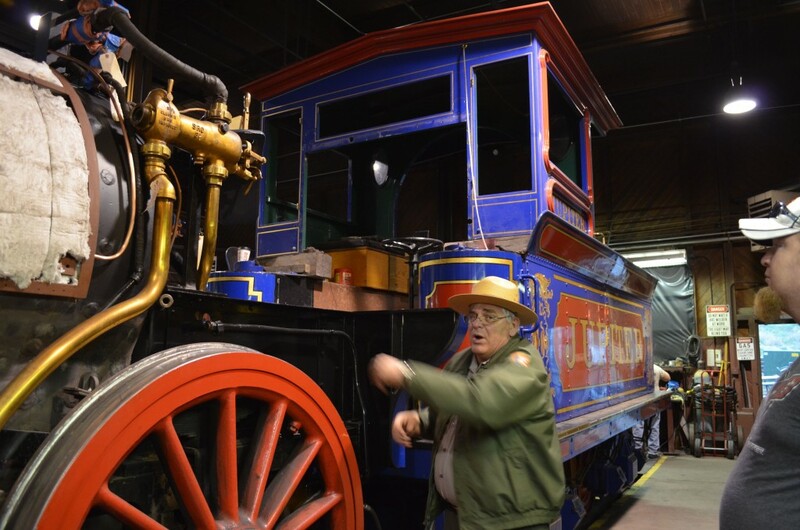 Both of the replica locomotives were disassembled…typically the engines undergo major overhauls in the wintertime. 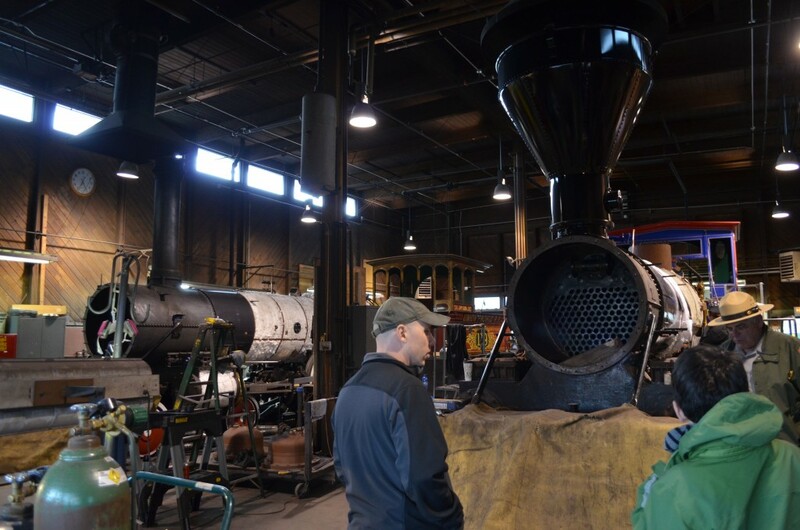 This is our park ranger talking about the Central Pacific “Jupiter” locomotive. This is a beautiful replica that was being cleaned up in preparation for its summertime excursions and May 10th reenactment of the Golden Spike ceremony. We got to see both the Jupiter and the Union Pacific No. 119 replicas in the shop, and the restoration work was very well done. We were seeing these engines partially disassembled, but if you click the links in the preceding sentence, you can see what they look like for the reenactment. The artwork replicated on the Union Pacific No. 119 is exquisite. 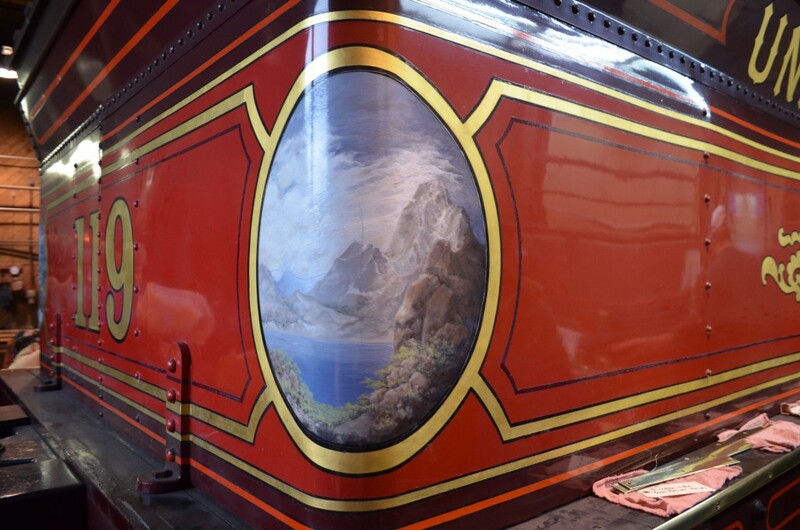 Disney animator Ward Kimball painted the scenes on both locomotive reproductions. 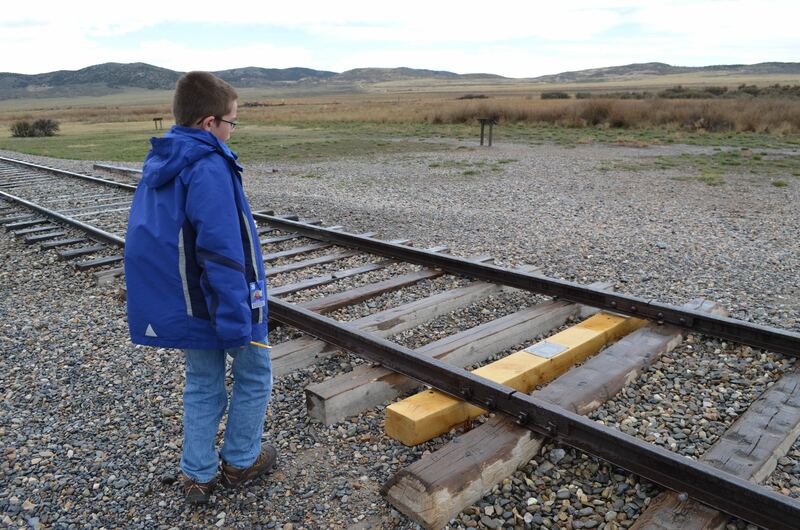 After visiting the engine shop (during which we had a torrential thunderstorm with hail), we headed back to the visitor center where we looked at numerous artifacts and learned more about the formation and importance of the Transcontinental Railroad. 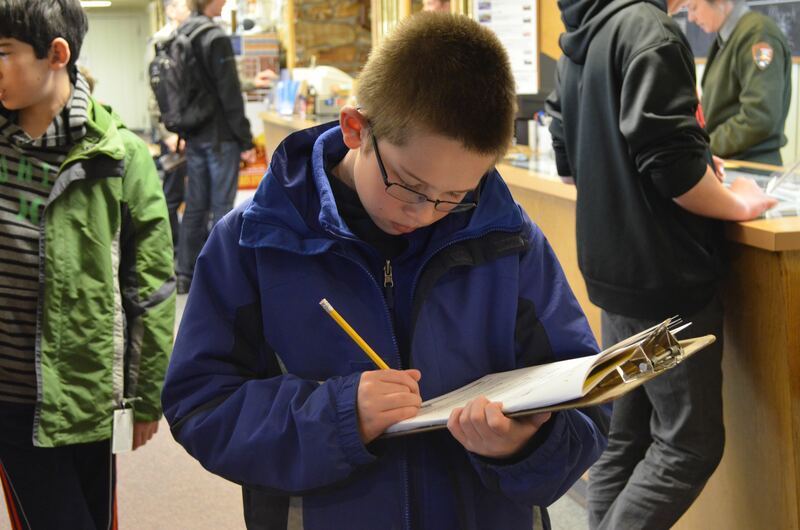 Timmy worked on his Junior Ranger badge…much of it involved his walking around the visitor center and nearby property to answer questions. 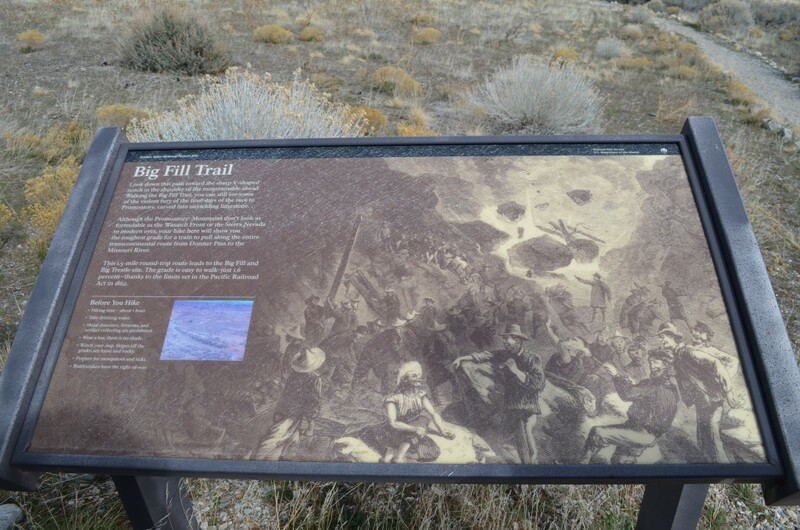 This sign was posted on the original transcontinental railroad (much of which has been removed because the traffic has been rerouted to commemorate Central Pacific employees laying just over 10 miles of track in one day. 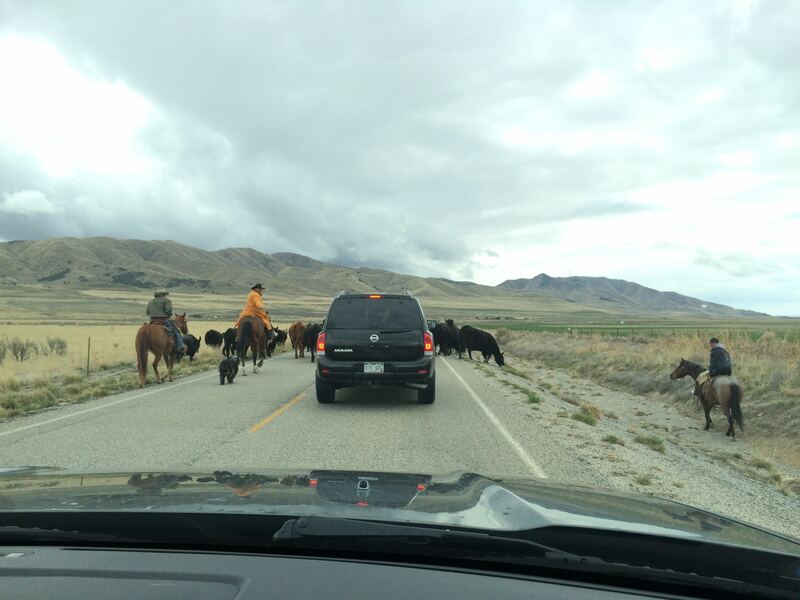 This occurred about 5 miles west of the Golden Spike ceremony location. 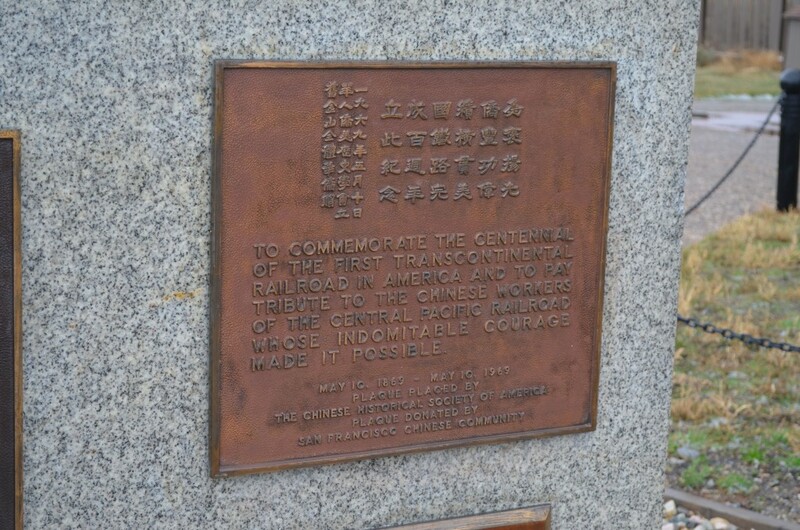 A plaque honoring the thousands of Chinese laborers who worked with the Central Pacific Railroad. This plaque was presented during the centennial celebration in 1969. 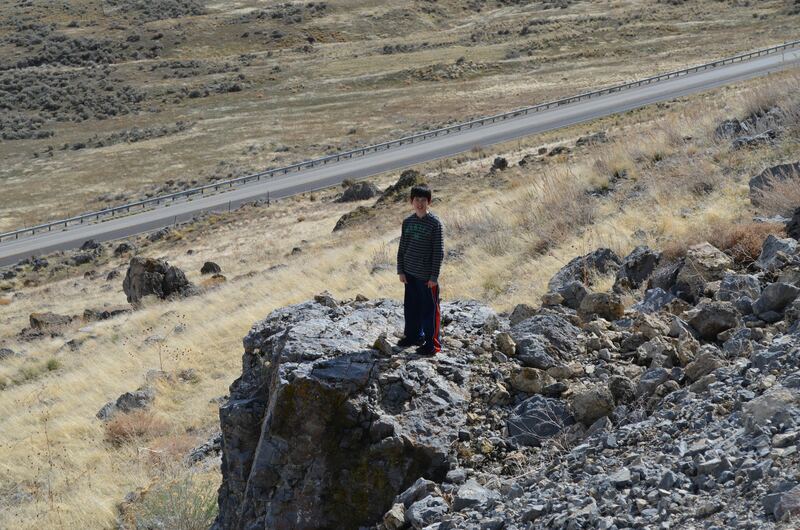 After our visit to the visitor center, we checked out some of the original grading near the area. 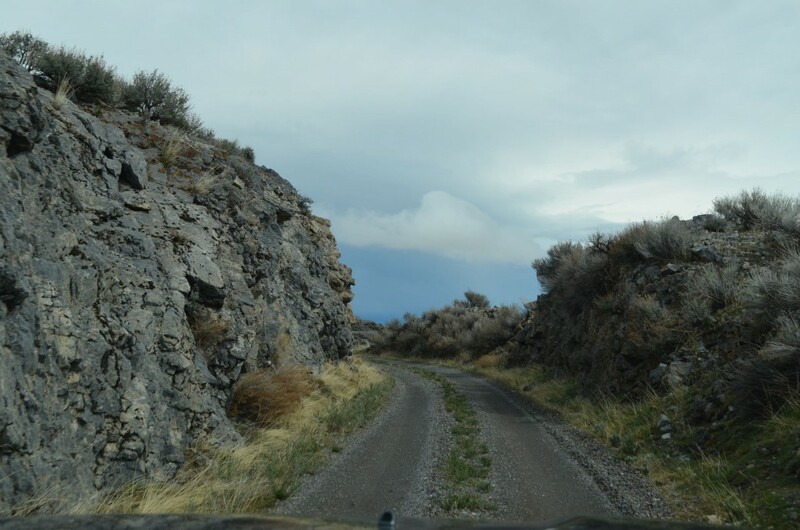 Much of these areas were hiking trails, but there was one driving route that we checked out. This is from the “East Auto Tour” along the Union Pacific part of the Transcon route towards the Golden Spike location. The “West Auto Tour” following the Central Pacific route was closed due to weather damage. The road is pretty treacherous so I wouldn’t recommend it for low-to-the-ground vehicles. 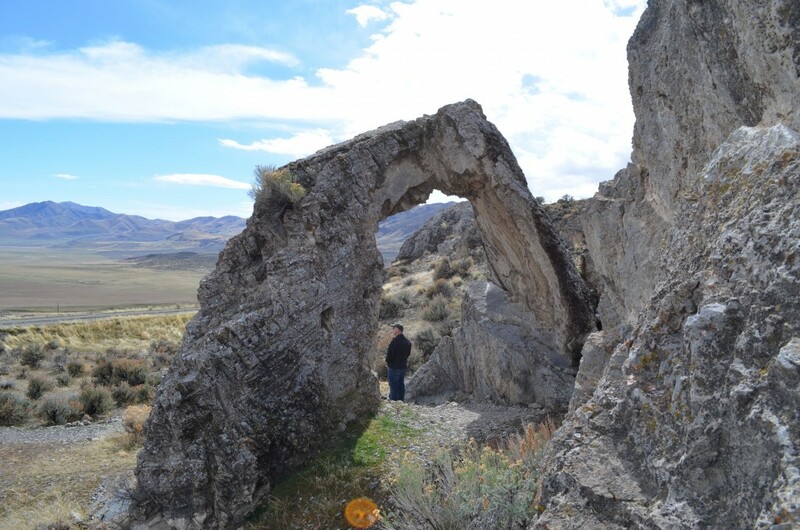 This is named “Chinese Arch”, perhaps for the Chinese workers who were among the first to see this feature, which was likely formed by erosion from when the area was on the shores of Lake Bonneville. After driving on the East Auto Route, we headed out to hike the “Big Fill Trail”, a 1.5 mile out-and-back trail along another part of the Central Pacific grade. It takes you out to this very high fill, which would have been hand-filled. Wow! 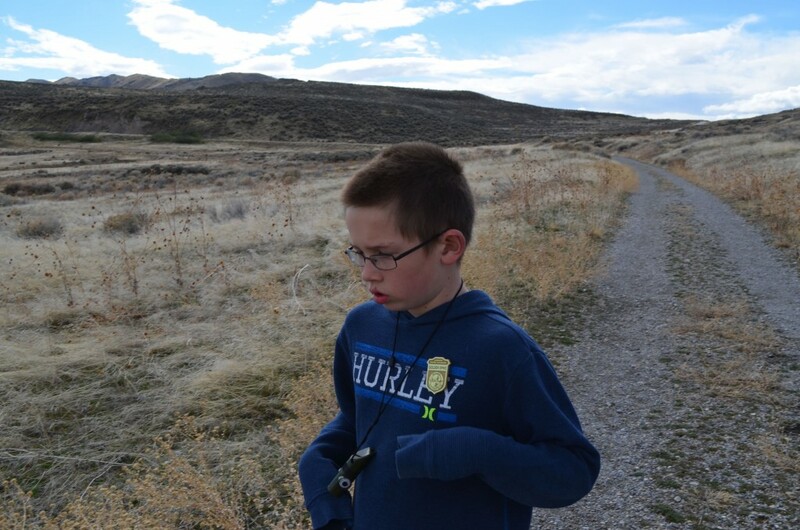 Timmy (complete with his new Junior Ranger badge) was not enjoying this hike. He twisted his ankle at one point and was pretty miserable for the remainder of the hike. Jacob was enjoying the hike immensely. Timmy was not. 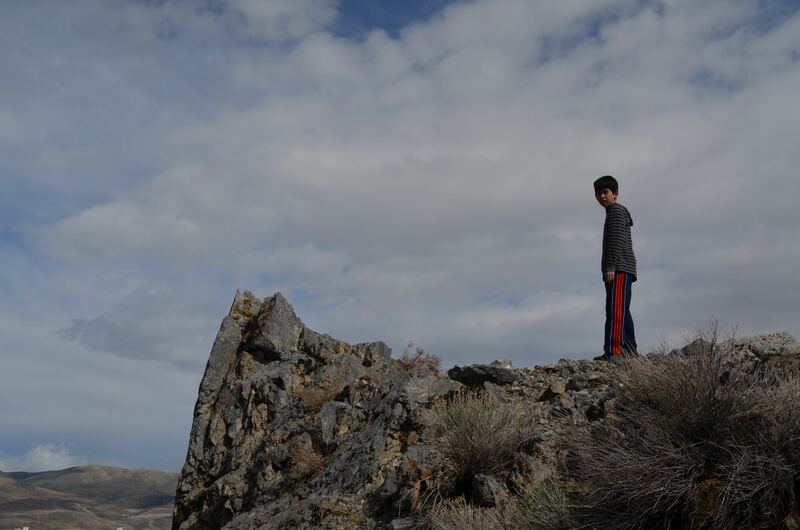 Jacob was climbing all over the rocks, asking me to take his picture…over and over again. The Golden Spike National Historic Site is located near Promontory, Utah, approximately an hour’s drive northwest of Salt Lake City. There is no admission charge, and plenty of parking. Allow at least 2 hours for the visit, perhaps as many as 3-4 hours depending on whether you want to include the engine shop tour and trail explorations in your visit, and plan for gas and food before your arrival. There’s a minimum of those amenities nearby. Do I think it’s worth the visit? I do. However, I’m not convinced our family would plan an entire vacation around it or anything. It was a great diversion during our Utah skiing vacation.